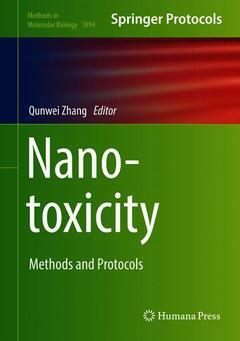 This volume explores the latest techniques used to investigate nanotoxicity. The protocols covered in this book range from routine nanotoxicity assays to genomic and proteomic approaches in vivo and in vitro. The chapters discuss specific topics such as preparation and utilization of 3D human liver microtissue models; assessment of ovarian granulosa cells with exposure to nanoparticles; DNA methylation analysis; evaluation of genotoxicity of nanoparticles in mouse models; and studying nanotoxicity using embryonic zebrafish. Written in the highly successful Methods in Molecular Biology series format, chapters include introductions to their respective topics, lists of the necessary materials and reagents, step-by-step, readily reproducible laboratory protocols, and tips on troubleshooting and avoiding known pitfalls. Cutting-edge and practical, Nanotoxicity: Methods and Protocols is a valuable resource for researchers and postgraduate students in the fields of toxicology, environmental science, pharmacological sciences, and clinical medicine. This volume also serves as a starting point for researchers interested in learning more about this developing field.